In New Orleans, Red Beans are traditionally served on monday, a day that used to be reserved for doing laundry. Red beans are a dish suited for a day of work around the house as they require long periods of simmering with only occasional stirring. Red beans come dried and have to be soaked in water overnight. Some people drain the soaking water before cooking but I like to use it as the cooking water. The base of red beans, like so many other dishes around here, is the Louisiana “holy trinity” of celery, bell pepper, and onion. The holy trinity is the traditional french mirepoix except with bell pepper instead of carrot. 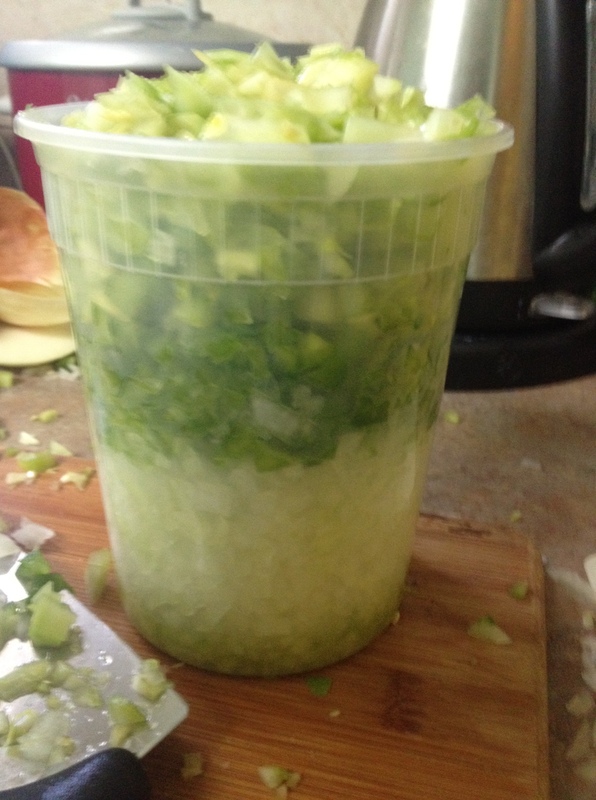 Chop two parts onion to one part celery and bell pepper. Adding smoked and cured meats to red beans adds a lot of flavor but there is no need to go overboard, some of the tastiest red beans I’ve had was at a Wild Magnolias Indian Practice and only had hot dogs in them. 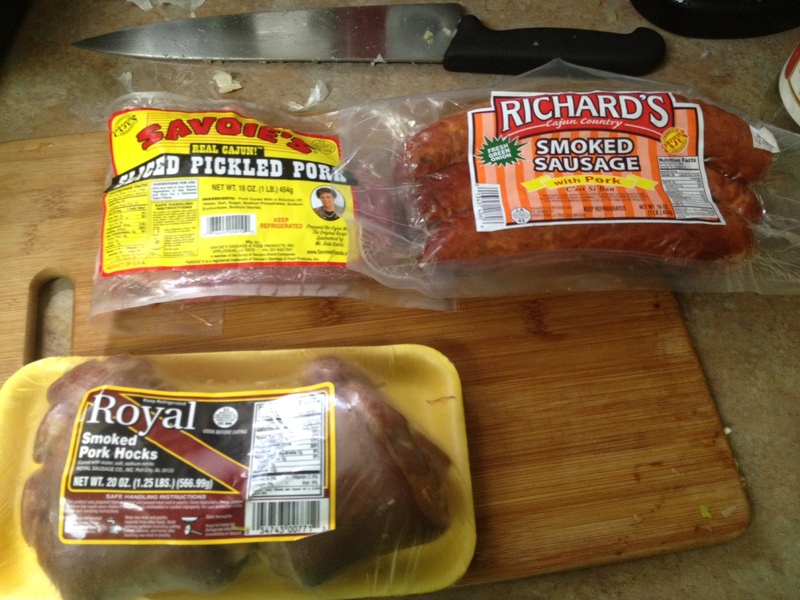 For this batch I used pickled pork, smoked ham hocks and smoked sausage. If I had to choose only one to use it would be the smoked sausage. If you don’t add any kind of pickled meat be sure to add some vinegar. Melt butter/lard or heat oil over medium low heat in a stock pot and cook the holy trinity in it. The vegetables should be “sweating” not sauteing, you can add a little salt to speed up this process. Add chopped garlic once they have cooked some. Meanwhile, chop up the sausage and brown the pickled pork in a pan. Once the vegetables are soft, add the meat and the beans. Add enough water/stock to cover an inch above the beans. Bring the beans to a boil then immediately turn the heat down to a gently bubbling simmer. Season the beans with creole seasoning (salt, pepper, cayenne, garlic powder, paprika, herbs), hot sauce and a couple bay leaves (my friend likes to add parsley near the end of cooking in place of bay leaves). Now let that simmer, stirring occasionally. Keep adding liquid as needed. Don’t forget some love and a few beers. A couple hours in, if you want creamier beans, take out a majority of the beans with a slotted spoon and put them in a bowl. Mash them up til they have a creamy texture, I like to add a bit more butter/fat at this point. Once you put the mashed beans back in it should look like this. 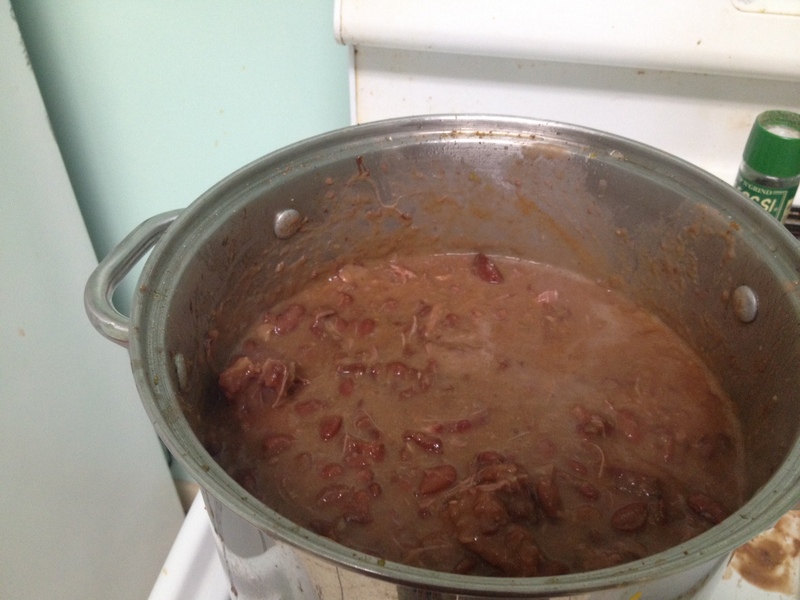 The beans should take about 3-5 hours to cook, you’ll be able to tell by tasting when they’re done. 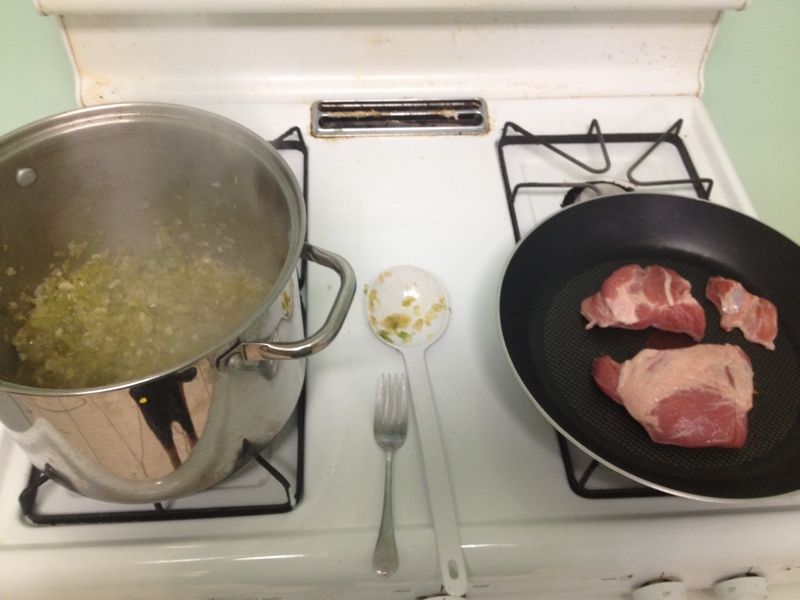 Once you think the beans are about done, start cooking some rice and fish out the ham hocks (and the bay leaves). You can pull the meat off the ham hock, chop it up finely and put it back in the beans. The pickled pork will break up by itself but you can help it out with a wooden spoon. Invite some friends over, mix the beans and rice with hot sauce to taste and enjoy! Eggplant Pizzas and Mango-Fennel Vodka Spritzer!